I read the article by Apollo Manga in the Second Life Examiner, about his role as ranger on the Playa. He writes that Burning Life Rangers are like “lubricants, reducing friction in the Burning Life community.” In a world that is self-governed, is there need for policing? The Linden Lab Terms of Service and Community Standards are in place as a set of rules for behavior – a LL book of etiquette if you will. But some folks choose to burn the book. Have you ever been in sandbox, happily building away, when you were suddenly swamped under an obnoxious mass of particles? Le sigh. If you’re being shot at by projectiles, shoved, caged, verbally abused and worse, you’re being griefed (see one of my experiences). Who do you look to for help? Linden Lab has its own tactics we can use. For example, we can mute a fellow resident, or fill out an abuse report. But sometimes things happen that are beyond our skill set. Sometimes, we simply want help. What’s more comforting than the sight of a superhero, flying to your rescue? Yes, you can put a call out to the Justice League Unlimited. The JLU will sweep away the nonsense and leave you safe and sound. They have strategies to cope with the wide range of issues that cause grief in-world, from the obvious to the insidious, and offer assistance to everyone from sim owners to newbies. The group began organically in 2006 as a crew of comic book fans, dressed as their favorite characters. Hanging around a sandbox one day, a couple of guys tackled a bothersome griefer using their innate tech skills, and from there, the JLU was born. It’s now made up of a 60-odd strong crew of scripters, artists, business people, authors, engineers – each contributing a particular talent to their collaborative undertakings. It functions much like a well-organized neighborhood watch. Their public service in SL has extended into the actual world; they sponsor and dedicate their services to a number of charity events, such as Project Jason. 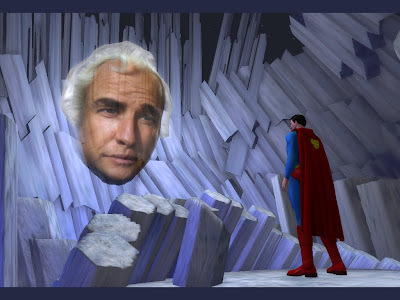 I was invited to Justice Island for a few sessions with Kalel Venkman, who offered a rare, behind-the-scenes look at the headquarters of the JLU. 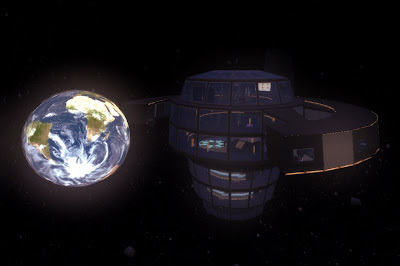 Business takes place in a stately space station, the Watchtower, complete with a dispensary of sophisticated gear, meeting rooms, a library, and a place of respite, in the form of Superman’s Fortress of Solitude. At the center of all is Brainiac, a tool designed by the League to monitor griefer operations throughout the grid. It’s a powerful piece of equipment, linked to all the gear League members carry about their person during patrols. Members go through a period of training and abide by a code of ethics that prevents misuse of any tool. While some may bristle at the idea of “policing”, Venkman is adamant that the League operates as a peacekeeping and education force only, in place to help all residents enjoy the best SL experience, free from unwanted interference. The JLU gathers intelligence about griefing actions and communicate regularly with Linden Labs. Member ZenMondo Wormser invited me on patrol one evening and I watched Kohaku Owatatsumi, JB Hancroft and Wormser whip through a sim full of zombies and shooters in no time. As for advice to newbies, when confronted, don’t retaliate, says Venkman. “That does no good and just gets you into trouble yourself." Their activities are a back breaking labor of love, like so much in SL, run on the good will of people who care that you have a good time. Although a dude or a dame in tights and a cape may not seem threatening, I assure you, they pack a punch. In a nice way. To read more about the JLU check out Krypton Radio.